The Darwin CBD is ideally situated around the picturesque Darwin harbour on the north west tip of the Northern Territory. The city centre has a very laid back and relaxed feel to it when compared to other capital cities around Australia, and this largely comes about because of the tropical weather that is so prevalent in Darwin. The CBD has a number of corporate offices, government buildings and defense headquarters, as well as all sorts of different retail outlets. There is also a range of luxury hotels and apartments in Darwin that have accommodation to suit the needs of every type of traveler. Along the water front in the CBD there are a number of fine dining restaurants and just a short distance from the city centre is the popular Mindil beach markets, the botanic gardens and the Darwin International Airport. 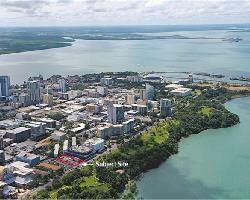 The Darwin CBD is laid out in a grid like fashion, which makes it quite easy to navigate and get around. The city centre also has numerous cafes, bars, night spots and tourist attractions like the fish feeding at Doctor's Gully, galleries, parliament house and museums. The area of Cullen Bay is conveniently located on the waters edge right next to the popular Mindil Beach and Skycity Darwin Casino. Cullen Bay is also just a short distance north west of the city centre and is the perfect place to stay if you want to be near all of the major attractions, businesses and government departments in Darwin. The centrepiece of this area has to be the beautiful Cullen Bay Marina, with its many luxury houses complete with private jetties, day spa and many shops, cafes and fine restuarants. When you choose to stay in Cullen Bay you will be able to easily walk to the Gardens gold course, the Darwin botanic gardens, the casino and the Mindil reserve with its beach, recreation reserve and tennis courts. This is also where the extremely popular nighttime markets are help on every Thursday and Sunday evenings at sunset. The suburb of Coconut Grove is a large residential and commercial centre that is located along the waters edge about 9 kilometres north of the Darwin city centre. The suburb has a large retail shopping area that includes such places as the Homemaker Village and Nightcliff shopping centre, both of which provide numerous large and small retails stores. The suburb of Coconut Grove is neighboured by a number of smaller regions known as Milner, Nightcliff and Rapid Creek, which has along the waterfront a public olympic sized swimming pool that is keep cool during the day by shade sails. Coconut Grove is well located just to the north of the Darwin International Airport and it is also just a short drive from the Charles Darwin University and Marrara sporting complex, which houses ovals and fields for a number of different sports including football, hockey, athletics, rugby, soccer, netball and bmx riding. The inner city Darwin suburb of Parap is positioned only 4 kilometres north of the CBD and provides a central place to stay that is close to the Darwin Airport, city centre and all of the main attractions in Darwin. 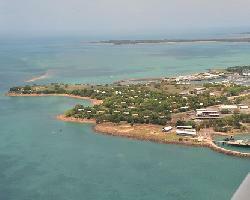 Parap and the neighbouring suburb of Fannie Bay are home to the museum and art gallery of the Northern Territory, the Fannie Bay Racecourse, the Fannie Bay Gaol and numerous businesses, shops and tropical parklands. Within the suburb of Parap there are a number of different hotels and apartments that offer both business travellers and holiday makers affordable accommodation of all standards. Just a short drive to the north of Parap you will find the East Point Recreational Reserve, which has the east point military museum, Lake Alexander and a number of scenic lookouts across the waters of the Top End. The outer satellite city of Palmerston is situated approimately 21 kilomtres from the Darwin city centre and provides a range of different travellers with another option when staying in the Top End. It is close to many of the city's major industrial and commercial centres along the Stuart Highway, making it ideal for people who want to be close to their work. One of the best aspects of staying in Palmerston is that the city itself has a very relaxed and almost village feel to it. This is because the city was well planned and has plenty of gree, open spaces, bike paths, resreational facilities, shops, cafes and restuarants. Within the city of Palmerston you will discover lots of things to see and do, as well as a number of different hotels and apartments that provides affordable accommodation to business travellers and holiday makers alike. 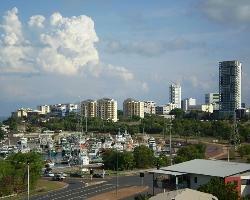 The heart of the northern residential area of Darwin is the suburb of Casuarina. It may be on the edge of town but it is still only 13 kilometres or a leisurely 15 minute drive from the Darwin city centre. The centre of this residential suburb is taken up by the Casuarina Square shopping centre, which is full of major department stores, boutique shops, take away food stores and a variety of other retail outlets. Casuarina is surrounded by a number of other smaller Darwin suburbs including Nakara, Lyons, Muirhead, Wanguri, Leanyer, Wulagi, Wagaman and Alawa. Also located just to the west of Casuarina is the Charles Darwin University, which is the largest educational institution in Darwin and has thousands of students enrolled in a wide variety of different courses and programs. The small suburb of Larrakeyah is perfectly situated right next to the Darwin CBD and is one of the city's premier place to live. 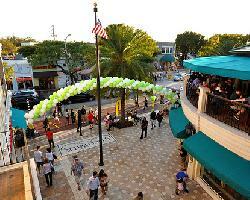 It features a number of luxury houses and is bordered on the western side by the Larrakeyah Army Base. Within this city fringe suburb there are some quality hotels and apartments that have been well appointed to make you feel right at home, as well as some very popular bed and breakfast accommodation. Many people believe that the location of this suburb is perfect because on one side you have the attractions of Mindil beach and the Cullen Bay marina, on the other side you have all of the corporate offices and attractions of the CBD and to the north there is the relaxing surrounds of The Gardens golf course. With a convenient location just 2 kilometre north of the Darwin city centre the suburb of Stuart Park is right in the midst of all the action that Darwin in known for. One on side of Stuart Park is the the main highway into town, the Stuart Highway which is lined with numerous shops, retails outlets and commercial businesses. If you travel over the highway visitors will find the lush, green expanses of the George Brown Darwin Botanic Gardens which is a popular palce for an afternoon or evening walk. On the other side of Stuart Park is the newly contructed area of Tipperary Waters with its luxury houses, extensive marina filled with boats of all shapes and sizes and wide array of shops. Staying in Stuart Park also means that you will be close to the Darwin waterfront precinct in the city centre and also just a short drive from the airport. 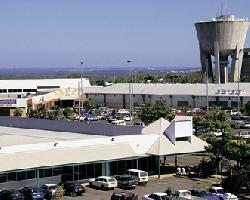 For an exciting night out in Darwin head to the SkyCity Casino which is located north of the CBD near Mindil beach. At the casino you can enjoy a delicious meal, see a show or have a gamble on the many tables and poker machines. For the motor car enthusiast Darwin has the Hidden Valley Motor Racing Track which hosts a number of races throughout the year, incluing the exciting V8 Supercars. Every evening you can witmess the fish feeding frenzy that is on display at Doctors Gully, which is just a short walk west of the Darwin city centre. Whilst you are in the Northern Territory you have to get along and see the huge fresh water crocodiles up close and personal at the Crocodylus Park, which is located just east of the Darwin Airport on McMillams Road. Located on the waterfront at Darwin Harbour the Darwin Convention Centre hosts thoughout the year a number of different exhibitions and conferences on all sorts of different topics. The Fannie Bay Racecourse is 7 minutes drive north of the CBD, is the home of the Darwin Turf Club and hosts numerous horse races throughout the year including the famous Darwin Cup. A great palce for a day out in Darwin is the Mindil Beach, were couples and families with kids can spend a relaxing day having fun and soaking up the tropical northern sun. If you are a gold enthusiast then why not play a round of golf on one of the many challanging courses in Darwin, including the Garden Park, Palmerston or Royal Darwin golf courses. The waterfront precinct on Darwin Harbour is a great place for visitors and locals to eat out, with a range of fine dining restaurants serving fresh locally caught seafood. Whilst you are staying in Darwin why not head out on a fishing tour. There are a number of charter companies that can take you out and help you to catch some of the fabulous fish that the tropical northern waters of Australia is known for. The George Brown Botanic Gardens and the Bicentennial Park along the esplanade are great places for you to enjoy a relaxing picnic with family of friends. The city of Darwin has a number of lush, tropical gardens that you can visit and take a relaxing stroll around all of the walking trails. The retail stores and boutique fashion shops along Cavenagh Street in the heart of the Darwin CBD are a must see for visitors who love to shop. 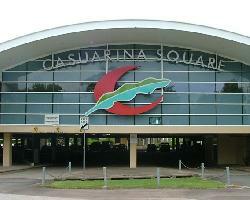 Situated at the northern edge of the Darwin city the Casuarina Square is the shopping hub of the north and has a huge variety of different shops and retail stores. The Palmerston Shopping Plaza in the large residental area of Palmerston is filled with a wide range of fashion shops, lifestyle and food stores. 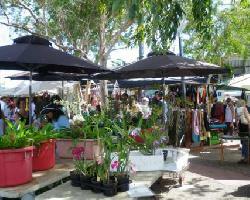 Held every Saturday the Parap Village Market is a unique shopping experience with over 50 boutique shops, galleries, food stalls and fashion outlets. As the sun goes down on Thursday and Sunday the Mindil Beach Night Market comes alive with a variety of stalls selling everything that you can think of, including exotic food, aboriginal art and crafts, as well as fascinating street entertainment. The world heritage listed Kakadu National Park is located 3 hours drive east of Darwin and is the most popular attraction in the Top End. This must-see destination features an abundance of wildlife, native wetlands, spectacular waterfalls, rock formations and scenic lookouts. The city of Darwin practically surrounds the Charles Darwin National Park which is a wetland of national signifiance, as well as having bike tracks, walking trails, picnic grounds and some great views of the Darwin city centre. The popular Litchfield National Park is situated just 2 hours drive south of Darwin and includes some amazing sights like the magnetic termite mounds, waterfalls and panoramic lookouts. An hours drive east of Darwin will bring you to the Harrison & Fogg Dam Conservation Reserves where you can view a large variety of different birds and plant species. Three and a half hours drive south of Darwin is the Daly River, which is a popular place for fishermen os all skill levels to drop a line and catch a huge Barramundi. Located 300kms south of Darwin is the magnificent Katherine Gorge, which is home to some beautiful rock escarpment and waterfalls. 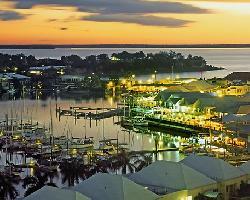 You can either take a long day trip from Darwin or stay overnight at one of the Katherine hotels or apartments.